Law enforcement careers typically pay well, offer good health and retirement benefits, and provide ample opportunity to help other people, whether those people appreciate the help or not. Getting paid to help others is a reward in and of itself, but even more rewarding is the opportunity to train and teach new police officers and influence the next generation of law enforcement professionals. That's why working as a police instructor is probably one of the best jobs available within the law enforcement profession. From the first day at the police academy, training officers help set the tone for a new officer's entire career. They instill discipline, uphold ethical principles and pass on knowledge and skills that are vital to safeguarding people's rights, preserving the peace and public trust and, most importantly to any officer, getting home in one piece at the end of their shift. Law enforcement training officers just may have one of the most rewarding, and most important, jobs on the force. Since learning never stops in law enforcement, police instructors work in a number of environments, from the police academy to the field. They are responsible for training brand new academy recruits as well as seasoned veterans. Training officers provide instruction in academic subjects such as law, human diversity, and interpersonal communications, as well as hands-on applications including firearms, defensive tactics, first aid, and vehicle operations. Police instructors may work for a police department or training commission, or they may work as an adjunct instructor at a college, vocational school, or police academy. They must stay up to date on legal bulletins, newest tactics, and latest trends in law enforcement techniques, practices, and technology. They must also prepare lesson plans and develop new training programs as new issues affecting law enforcement are identified. It's no secret that law enforcement careers are dangerous. Training officers work hard to make sure that their recruits and fellow police officers receive the best training possible to help keep them safe and get them home at the end of their shifts. Because the actions of officers later on in their careers will often bring focus on the training they received, law enforcement instructors have an awesome responsibility and bare a great deal of liability for the performance of their students. Law enforcement instructors are typically current or former law enforcement officers, meaning certification as a law enforcement officer is most often required. Additionally, special instructor certifications in various areas of training are necessary to be able to teach new recruits and other officers. 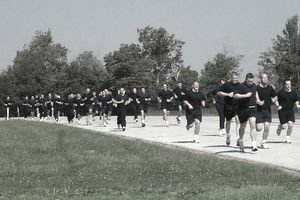 Individual instructor courses typically require 40 to 80 hours of training, as well as internships, meaning that police instructors must undergo hundreds of hours of additional training to be certified as instructors in the various techniques. Though it may not always be required, it is beneficial to hold a college degree when seeking a job as a police instructor. Instructors who are employed by law enforcement agencies or police training commissions may be required to have several years of law enforcement experience before they can serve as an instructor. They may also be required to undergo a background investigation, which may include a polygraph exam, before being hired as a police officer. Law enforcement careers are expected to grow by 5% through 2022, slower than the national average for all occupations. Due to attrition, while the number of positions may not grow rapidly, the number of actual vacancies may increase significantly. This means that there will likely be a growing need for police instructors to train new officers to fill these positions, and these careers are anticipated to see the growth of up to 19%. Instructors earn, on average, $62,000 annually. Salaries can vary widely, though, depending on the agency and location. Is a career as a police instructor right for you? There are few careers as rewarding as those that provide opportunities to pass on knowledge and skills and influence the next generation of professionals. Law enforcement instructors enjoy the tremendous intangible benefits of watching students they trained ​to grow and develop in their chosen field of law enforcement. If you are drawn to criminal justice and criminology careers and enjoy teaching and research, then working toward the goal of becoming a police instructor is definitely worth pursuing. You may just find that it's the perfect criminology career for you.